You can alert someone to the contents of this page by emailing them a link. All fields are required. Only one email address can be specified. To prevent abuse please type the security code below into the box underneath. Please help us to improve the site by rating the quality of this article by clicking a button below. Recently a developer came up to me and started asking questions about a problem he was experiencing with a stored procedure he’d written to query a large table. He’d been looking at the execution plan and noticed that the stored procedure was table scanning one of the tables that it was querying. The query was fairly straightforward with two columns specified in the WHERE predicate, but the table was large. He had quite correctly decided to create an index on those two columns. Surprisingly this did not seem to resolve the situation as the stored procedure continued to table scan the table. At this point he asked me to look at the problem. On the face of there was no obvious reason why the query should not have made use of this index. After trying a few things and not succeeding in getting the query to use the index I decided to see what the Database Engine Tuning Advisor (DETA) made of the query. At this point I suddenly realised what the problem was – there was no primary key on the table. 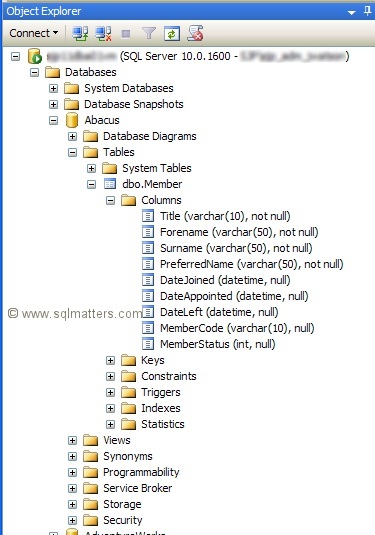 The problem was that although the optimiser could use the index to identify the correct rows in the table to meet the where condition, it would then have to go back to the table to get the columns specified in the select statement, but it required a primary key on the table to be able to do that look up. If this was a database we owned then we could have added a primary key, either by identifying an existing column to use or to add an extra column and specifying it as an identity column. Unfortunately it was a third party supplied database and it wasn’t practical to make structural changes. All in all a neat solution to the problem in this instance, though I can’t help feeling that it would still have been better to have had a primary key on the table in the first place. Post a comment No login required !